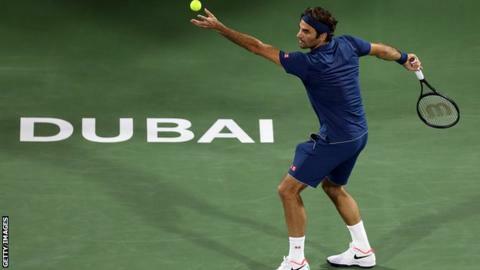 Roger Federer claimed his 50th win of the Dubai Tennis Championships by beating Spain's Fernando Verdasco in three sets to reach the quarter-finals. Federer moves a step closer to his 100th ATP singles title with Wednesday's 6-3 3-6 6-3 victory. The 20-time Grand Slam winner, 37, will face Hungarian world number 35 Marton Fucsovics for a place in the last four. Meanwhile, there was a shock defeat for top seed Kei Nishikori against Polish qualifier Hubert Hurkacz. Hurkacz converted six out of seven break points to beat his Japanese opponent 7-5 5-7 6-2. If Federer claims a record eighth title in Dubai, he will claim a century of ATP victories, with only American Jimmy Connors ahead of him on 109. Fucsovics set up his quarter-final against second seed Federer with a 6-4 6-2 win over Germany's Jan-Lennard Struff. Frenchman Gael Monfils eased to a 6-3 6-2 win over Marcos Baghdatis of Cyprus, while Spain's Roberto Bautista Agut was beaten by Georgian Nikoloz Basilashvili 6-7 (2-7) 6-4 6-3.